We first heard of a neat event at the local university through ABC News and it was filled with just the right amount of warm fuzzy feeling that Ecoyarns had to jump on board. Australian National University (ANU) had called upon its staff and students to knit scarves for its newest students who will begin their university life in one of the coldest campuses in Australia at the moment. Over the last couple of months, knitters and crocheters throughout the campus had picked up their needles and hooks, some for the very first time, and worked tirelessly to make over 110 scarves! 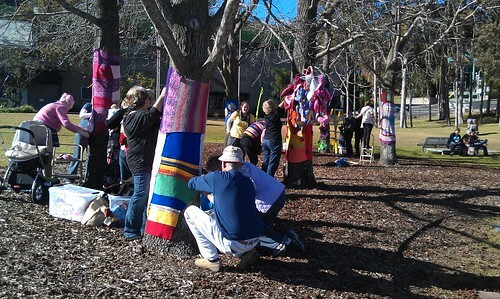 The Canberra community rallied around this unique initiative through yarn donation, including some of our Ecoyarns yarn. Some generously contributed their time to teach their craft to those eager to learn to make a scarf for a fellow student. The scarves will be on display at the Orientation Week Wellbeing Mini-Market Day this coming Monday and new students are encouraged to pick a scarf for themselves. Each scarf comes with a handwritten note from the maker to its new owner, with care instructions and a little personal welcome to ANU. How good is that for building new friendships? As you can already imagine The Knit for New Students Initiative is not just about keeping these newbies warm. It is much, much more than that and that is why we chose this ANU project to be our first sponsorship. Knitting and crocheting is not just a personal hobby. Normally it keeps us and our loved ones warm, and our homes looking groovy. Then a little event comes along and our sense of camaraderie kicks in and we knit for strangers, be it to wear or just for public viewing and appreciation (think yarn bombing). We sit around with friends and people we hardly know, physically or virtually, and our hands keep making while we chat and form new friendships. Our often mundane lives suddenly get a little pick me up and the warm fuzzy feeling puts a smile on our dial for most of the next day. It’s a beautiful thing. It’s good for our mental health and it’s food for our soul. Our lives are enriched because we care enough to spend the time to create for strangers. A student common room transforms into a knitting hub. You can almost hear the clinking of the busy needles. So thank you to all those who knitted and crocheted in earnest to create these scarves. We hope you enjoyed our yarn contribution and we will see you on Monday. Ecoyarns will be posting photos of the event live through our Instagram. Follow along if you’re interested. Have a warm, snuggly weekend. We’re praying for our first snow on Sunday! Fingers crossed. What a glorious weekend it was! The sun was out and it was a balmy 20 degrees on Saturday. 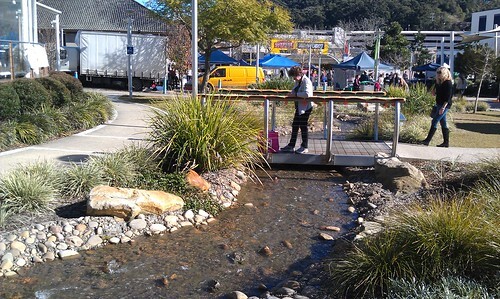 It was a perfect morning for a little visit to the Gosford City Markets. The markets are held every second Saturday of the month in Kibble Park from 8 am to 1 pm. Last Saturday they had a Christmas in July theme and there were performances held on stage the whole morning. As I meandered my way past the fresh bread stall to the fresh produce stalls, my husband pointed out that the bins were covered in crochet. I was rather puzzled but didn’t take much notice of it. My stomach was rumbling and I wanted food! Haha… So we bought a pie and fresh popcorn and nibbled at them while browsing the stalls selling lovely handmade bags and soft toys. We were walking along and to my surprise, we saw this right near the stage. Yarn bombers! 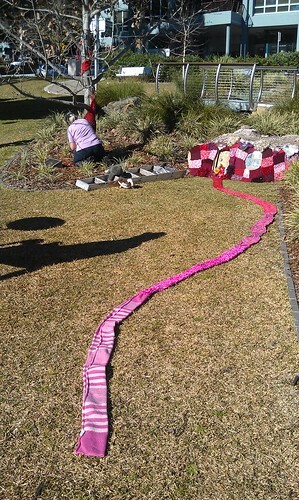 A group of local ladies, lead by the Bowerbird Project in Gosford, were setting up an art display. 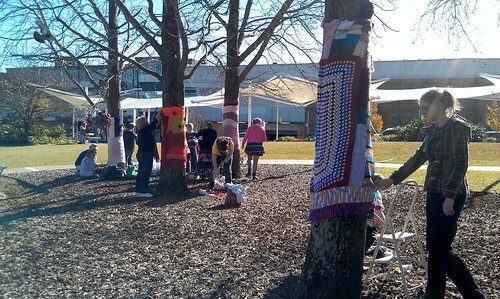 The display is called “Putting the heart in Gosford” and it involved dressing up the deciduous trees in Gosford’s City Centre with yarn. It looked to me that the ladies had quite a bit of support from their family and friends too. Good on you fellas and littlies! The artwork was not limited to the trees. Besides the bins being topped by crochet work, the mini bridge got a pretty dressing too. And even the rocks were not spared! So much colour and texture packed into a small park. 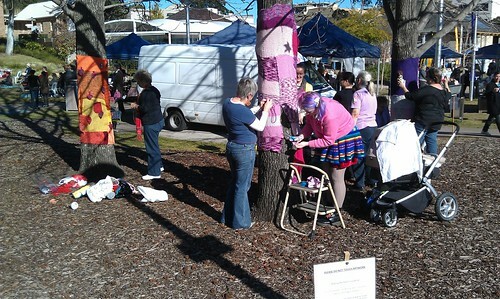 It was really exciting to see yarn bombing being brought to life on the Central Coast. 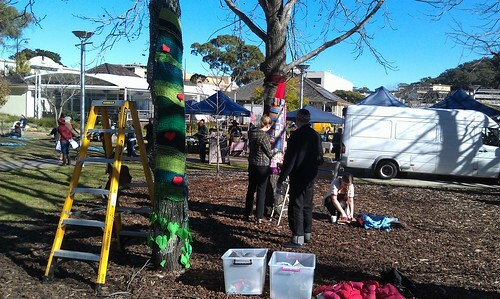 We are not the big city like Sydney but the passion for knitting and crocheting is well and truly alive here. Big thumbs up to all those involved. 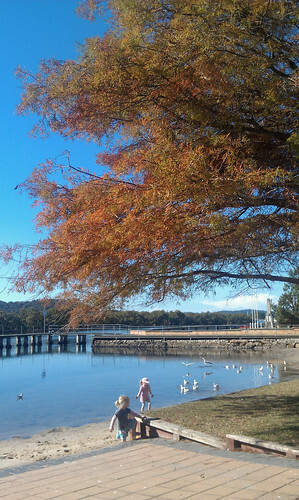 Thanks for making Gosford a less dreary place to visit. Hello again! How have you been? I’m well and plodding along with my big belly, feeling more and more like an ogre than a woman at times. I’m also rather forgetful. 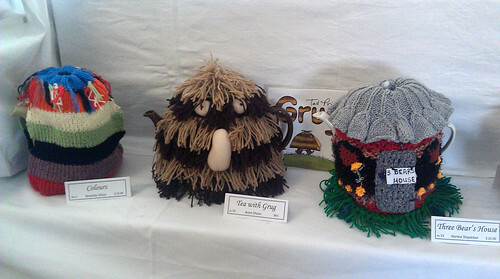 It’s taken me a month to remember that I wanted to share the Teapot Cozy Exhibition with you. Oops! 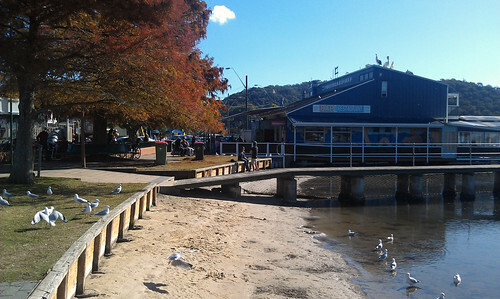 It was a beautiful Saturday afternoon at Woy Woy. It’s early June and the weather is starting to feel real cold at times. We went for coffee with my in-laws and had a nice stroll along the waterfront after that. The trees were stunning at this time of year. I love the crimson oranges and reds in the leaves against the bluest of blue skies. There were lots of people out and about enjoying the sunshine. No one seemed to mind the cold when the sun is out like this. We walked around the corner towards the Country Women’s Association building and realised that the yearly Tea Cozy Exhibition was on! They even had tables and chairs out on the lawn where you can have yourself a nice Devonshire Tea. Too bad we had already eaten. But naturally we had to have a stickybeak at the tea cosies. 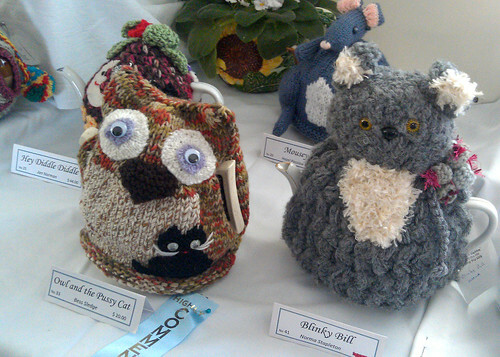 There were two main categories you could enter your tea cosies into – Children’s Stories and General Section. I especially like the entries into the Children’s Stories. Aren’t they just the cutest? Such creative handiwork! I love the Grug! And the picture above is the winners’ table. I personally would have picked some other cosies to win. 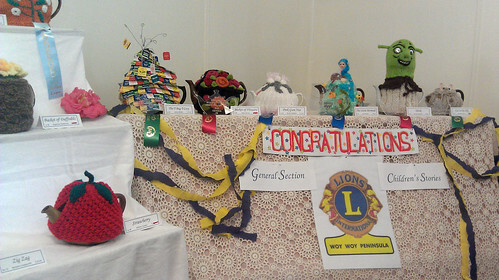 But there were many good entries so judging must have been quite hard. Looking at the pictures now make me feel like having a pot of tea. Hehe… But I’ll control myself (for now) and just talk to you a wee bit longer. I have been knitting and crocheting a little. But my arm and shoulder gets really sore pretty quick nowadays. I’ve been told that pregnancy may cause carpal tunnel so I’ve been careful not to overdo things. This, however, means that progress on my projects are moving at a snail’s pace. Do you recognise the yarn? 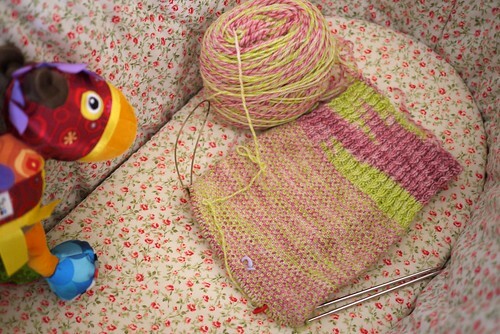 It’s the sock yarn that Vivian jelly dyed for me. Pretty isn’t it? If you missed Vivian’s tutorial, you can check it out HERE. It’s so cool how you can dye yarn using ordinary jelly crystals and the microwave. Anyway, fingers and toes crossed that I get the sleeping bag finished before my munchkin is born. It’s less than 5 weeks away! Boy, oh boy, time flies when you’re having fun. Keep those hands busy and stay warm everyone. Chat again soon. Ta taaa!